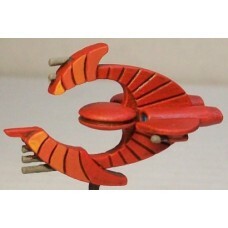 This Frigate is ~1-1/2"L x ~1-1/8"W x 1-1/8"H (38mmL x 28mmW x 28mmH), comes with 2ea Plasma cannons, but does not include a 1" Black Plastic Flight Stand (available in my Accessories section, and sold unpainted). Designed by Drew and inspired by Robert Provan. Minis painted by Impoverished Lackey Hobby Services.